A controversial Tomer Hemed goal condemned Wigan to their second defeat of the season at Loftus Road. The QPR debutant fired home from close range 10 minutes before the break from a Rangers corner, after what appeared to be a blatant push on Latics defender Chey Dunkley. However, despite being told by his linesman that it was a foul, the referee wasn't interested. The visitors enjoyed the lion's share of possession and chances throughout the game but couldn't break down their plucky hosts but Paul Cook won't be too disappointed with what was another positive display by the Championship newcomers. 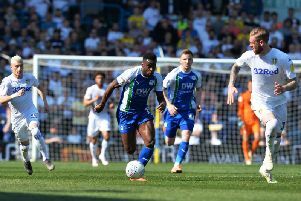 Latics were without Michael Jacobs, who pulled up with a hamstring injury at Stoke in midweek, while Nathan Byrne made his return to the starting line up following his injury. Despite an impressive start at the club, Reece James was dropped to the bench, but this was more of a tactical decision made by Cook given he's expected to feature for England under-20s in the international break and has just played twice in five days. After both sides spent the opening 10 minutes finding their feet, Latics took control. Will Grigg almost turned in Lee Evans’ cross before Nick Powell’s free-kick was saved by Joe Lumley in the QPR goal and Chey Dunkley headed wide from a corner. Powell was at the centre of almost everything positive Wigan created. With the game 15 minutes old, he casually dispersed Rangers of the ball in the Latics half and glided forward before picking Grigg out with a pearler of a ball. The Latics frontman controlled it well to calmly play in Josh Windass whose fantastic effort was tipped behind by Lumley. Powell was once again on hand to cause a nuisance from the resulting corner, heading just wide after finding himself in acres of space. After a dismal start, QPR understandably looked nervy but credit to their crowd who stayed with them despite some wasteful passing. Debutant Nahki Wells always looked a constant threat though and dragged an effort across the face of goal for the home side. His inclusion seemed to spark the hosts and encourage his team-mates to play more directly, lifting the crowd in doing so. The game got a little tastier with Angel Rangel going into the book for a crunching tackle on Windass before Byrne returned the favour and was given the same punishment. Disaster struck for Latics as first Gavin Massey hobbled off to be replaced by James before QPR controversially opened the scoring from a corner. Hemed picked up a loose ball six yards out to fire home but Latics players were furious after Dunkley appeared to be bundled to the ground in the process. The referee wasn’t interested and Rangers had the lead against the run of play. Latics pushed and pushed for the remainder of the half but couldn’t break down the resilient hosts who came out of the blocks flying after the break. Within the first minute, Luke Freeman was allowed acres of space on the edge of the box but could only find the side-netting before Wigan had to withstand a wave of pressure. Eventually things settled and Wigan regained controlled but were consistently left frustrated. QPR adopted two banks of four and remained solid, with Latics reduced to crosses into the box or long range-efforts with Evans, Powell and Sam Morsy all fancying their chances from distance. The latter felt his effort was blocked by an arm as it traveled towards goal. Latics' biggest threats were Windass and Powell who linked up well and despite Grigg having one of his quieter afternoons he still came close to poking home a good few crosses. Powell also latched onto one from Byrne which drifted agonisingly wide. The players, willed on by the 546 Wiganers behind Lumley's goal, continued to mount the pressure as James Vaughan and Gary Roberts entered the fray for Byrne and Windass and with five minutes left Latics came the closest they would all afternoon as Dunkley got his head on a corner but it bounced agonisingly wide. In the dying moments, Latics were given back-to-back free-kicks on the edge of the QPR box with Evans hitting the first man on the initial attempt before putting in a superb cross for the second. However, with Christian Walton forward, it was his opposition number Lumley who got to it first to punch clear as the full-time whistle went. Latics: Walton; Byrne, Dunkley, Kipre, Robinson; Morsy, Evans; Massey, Powell, Windass; Grigg.